For once, “Flash Sale” actually means what it ought to! A whole bunch of digital Flash collections from the Silver Age through the modern age are discounted on ComiXology this week for $5.99 each (even the long ones, like the Flash by Mark Waid and Flash by Geoff Johns collections), and dozens of individual Flash and Impulse issues are $0.99 each. Also included are Final Crisis: Rogues Revenge, Forever Evil: Rogues Rebellion, a number of Rogue-heavy issues, some Flash/Green Lantern crossovers, the main Flashpoint story, Rebirth, parts of Convergence, the Flash DC RetroActive specials, the Flash: Season Zero comic based on the TV series, the Tangent Flash issues, and more. The later New 52 and DC: Rebirth books are on sale, but I figure you probably know already whether you’re interested in those, so I’m going to talk about the older books. I would absolutely recommend the Flash by Mark Waid vol. 1-3 and Flash by Geoff Johns 1-3 collections. $6 for a dozen or more issues is an amazing deal, and there are some great stories in there. (Flash by Geoff Johns vol. 4 is a little more uneven than the first three, IMO.) The Manapul/Buccellato run from the early New 52 is also quite good, as are the two Morrison/Millar books with Paul Ryan and Pop Mhan (“Emergency Stop” and “The Human Race”). I’d also highly recommend the early issues of Impulse by Waid and Humberto Ramos. You can find gems like the original Flash of Two Worlds in Flash #123, the first Superman/Flash race, “Nobody Dies” (Flash v2 #54), Wally meeting his younger self in Flash v.2 #0, the entire Trial of the Flash, and the first appearances of Jay Garrick in Flash Comics #1, Wally West and Weather Wizard in Flash #110, and Reverse Flash in Flash #139. 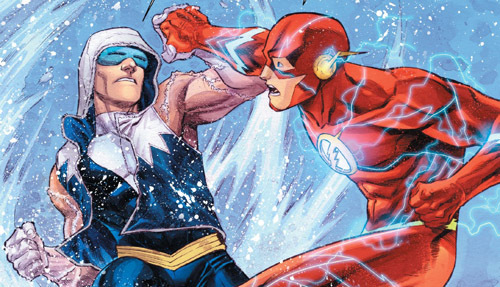 The story with the Captain Cold Censored Flash cover is in here too. If you’re interested in the classic Silver Age Flash, now’s a good chance to pick up some of those collections as well. If you’re on a budget, go with Flash: A Celebration of 75 Years. $6 down from $30 for this collection can’t be beat. I wouldn’t bother with the Flash: Fastest Man Alive collections or Road to Flashpoint unless you really want a complete set. This entry was posted in Timely and tagged Digital Comics, Sales on August 21, 2018 by Kelson. The Flash has been consistently selling about 38-39,000 copies of each issue since May (with a spike for Villains Month). And that’s a typical mid-range book, successful enough that DC is putting the creative team on Detective Comics. Digital figures aren’t available, but articles typically estimate digital sales at about 15% of print sales across the board. So let’s say around 44K between print and digital. “Arrow” reportedly pulled in 3.17 million viewers for “The Scientist” guest-starring Barry Allen. A lot more people watch TV than read comics. This entry was posted in Flash News and tagged Arrow, Flash TV Show 2014, Ratings, Sales, TV on December 16, 2013 by Kelson. It’s been a while since I’ve written up sales analysis, partly because of time, and partly because I’m really not sure my analysis means anything. So here are three months of rankings from Diamond and the sales estimates* from ICv2: for #19 in May, #31 in June, and #29 in July, selling roughly 53K copies of Flash #11. There’s a really steep drop with #10. As The Beat points out, DC stopped shipping a 1:200 variant covers with that issue. Additionally, Flash #10 and Flash #11 both have fill-in artists, which may have led retailers to order less. We’re also seeing, a year into the New 52, the series dropping below the level where volume 3 settled at around 55K. It’s been dropping in the rankings as well, but a lot of that can be attributed to Avengers vs. X-Men and Before Watchmen. (Note the sharp drop in rankings between April and May, while estimated sales numbers stayed pretty close.) And the Flash isn’t alone. The New 52 seems to have lost a lot of its initial luster, which is no doubt part of why DC plans to revitalize the line with its Zero Month in September. *What these numbers measure: US-only sales, wholesale from Diamond to comics retailers. They don’t count sales through bookstores, they don’t count international sales, and they don’t count how many copies were actually bought and read…but they do measure the same thing every month, which means they can be used to spot trends. This entry was posted in Flash News and tagged Sales on August 6, 2012 by Kelson. Estimates at ICv2 have the series selling 64,975 issues in March and 63,702 issues in April. On the downside, the book is selling half what it sold last September. On the plus side, it’s still ahead of the 53K mark it had reached at this point in the previous volume. Better yet, those month-to-month drops are getting smaller, suggesting that it may find its level soon. I’ve suggested before that if it levels out above 55K (where volume 3 settled), the Flash relaunch is probably a success. Though it may be cutting things a bit close. Update: Christopher Schmitt brings up digital numbers, which I forgot to look for. CBR has been running monthly interviews with Bob Wayne & John Cunningham in which they discuss the month’s sales, including DC’s own digital rankings (but not actual numbers, which most companies are still keeping quiet about). I’ve mentioned before that The Flash doesn’t rank as well digitally, where it hasn’t even made it into DC’s top 10 yet (here’s March). DC released their April Top 20,** and Flash came in at #18 digitally, compared to #8 in print if you look only at DC’s output. 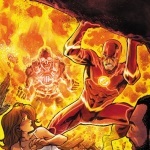 **It’s not clear how comparable the rankings are, since Diamond’s rankings are for sales over the whole month, and DC’s digital chart here is described as “Best Selling Single issue in a week.” Though since The Flash comes out the fourth week of the month, there probably isn’t much difference. This entry was posted in Flash News and tagged Sales on May 21, 2012 by Kelson. 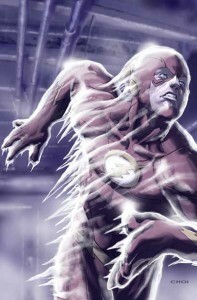 February estimates at ICv2 have The Flash #6 selling an estimated 68,061 copies, down 5% from the previous month. Given the high profile of the relaunch and the usual trend of series to shed readers over time, it’s hard to say what the numbers really tell us…but the drops are shrinking, the rankings are steady at #8, and it’s still ahead of the 57K sold by Flash vol.3 #6 and the 55K mark where volume 3 settled. It’s worth noting that we’ve had seven issues in a row with no delays and no creative team changes. Update: I forgot to mention that, like last month, Flash didn’t appear in the digital top 10. This entry was posted in Flash News and tagged Sales on March 30, 2012 by Kelson. This marks the third month in a row that the Flash has been ranked #8, and the sixth in a row that it’s been in the top 10. In fact, every issue of the series since the relaunch has been in the top 10. It’s been a long time since the Flash was ranked that highly. Even the high-profile relaunch of Flash: Rebirth dipped below #10 in the middle of its run, and the Geoff Johns/Francis Manapul series spent most of its time in the 11-20 bracket. Of course the streak will probably break next month when Marvel launches Avengers vs. X-Men, but during the time between giant events, with the series competing mainly against other regular series, it looks solid. If DC is nervous about this book, the rankings suggest they shouldn’t be. *Usual note: These are US print sales only. This entry was posted in Flash News and tagged Relaunch, Sales on March 9, 2012 by Kelson.